Home › Triathlon Rules › Can I Swim Backstroke During a Triathlon??? YES! You may swim any stroke in a triathlon. People often choose Freestyle, but you don’t have to do Freestyle. We strongly encourage triathletes be proficient at Freestyle and Backstroke at a minimum, both to add variety to their practices and give them the ability to roll onto their back and breath freely should an emergency situation arise. While Breaststroke is much slower than Freestyle or Backstroke, it makes it easy to lift your head to see during the breath. You may also use modified versions of the strokes or even tread water or float (there’s no “official” way to float, so really anything goes). You may also stand on the bottom or hold an inanimate object like a buoy or boat, so long as the object does not help them progress forward. 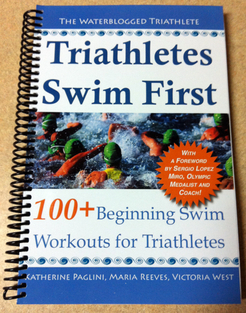 Many people get routed to our blog wondering if they can swim backstroke during a triathlon. Many others wonder if they can wear hand paddles. The answer to that question is no, as hand paddles create artificial propulsion and fall under the category of “Illegal Equipment” for that reason. ‹ Rocking my Training, Hope You are too!!! Thanks! I probably should have posted this ages ago… at least now I have the answer posted when people get routed to our site!